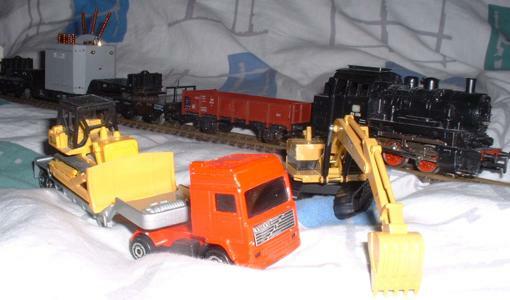 When I was about five years old I got a model railroad for christmas. It was an oval with a steam loco, and three passenger wagons from in scale H0. In my early teens I bought more tracks, trackpoints and another train (various goods wagons and a DB V212 diesel loco) and built a larger layout. Now as my kids are grown up, and I begin having spare time, I plan to build a large display in a spare room. Therefore I buy and collect items with this goal in sight. So far I have some 10 locos, about 60 wagons, some 125 meters of track, and other acessories. To the right a couple of pictures of my rolling stock... 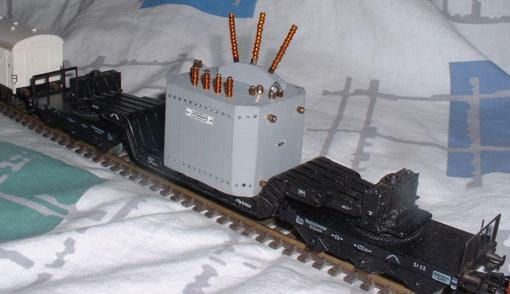 The power transformer on the heavy load wagon is homemade.